"Meanwhile, the city's legal department is looking to see what, if anything, it can do about the First Amendment banner." Via Radley Balko. The city told Herb Quintero that he did not have the right to paint a mural on the side of his building, and had to cover it up. 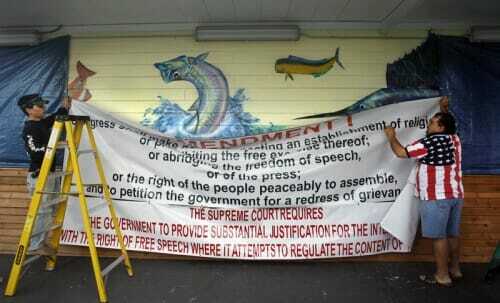 So he did, with a banner containing the text of the First Amendment. Image from here. Speaking of building codes, we are about to get some repairs on our pool inspected. To pass the inspection on our pool, though, we have to spend thousands of dollars inside of our house. Phoenix building codes require all kinds of crazy rules for home entry doors to the pool area. For example, they all have to be self-closing and have to have deadbolts 54" off the ground, which I can assure you that no house built normally actually has. No window can open more than 4 inches. This is a problem for us, because we have a series of French doors opening to the pool area, giving us 9 separate doors we have to modify or replace. We are lucky we are grandfathered and don't have to put a fence around the pool area as new homes do (our backyard is fenced of course, but regulations require new homes to have a fence around the pool itself). I know a lot of folks whose first activity in buying a new home is to pay someone to rip out the fence once the home passes inspection. The rationale is to keep kids from drowning, I guess, but the number of kids who drown by sneaking out through 5 inch window gaps, or even unlocked doors, is vanishingly small (the number of kids that drown in homes with no small kids is also small). Kids drown when parents know they are outdoors but fail to supervise them closely. We have no small kids in the house, but when we did, we supervised them very closely and put them through swim school before they were five. But politicians, when there is a high-profile drowning, feel they need to "do something." Since they can't legislate good parenting, they add to the already bloated building code, often sticking in pet requirements of lobbyists representing particular building materials and services. Well, it turns out there are any number of companies in Phoenix who specialize in getting your home ready for this inspection. They will come in and install all kinds of temprorary hardware, then come back after the inspection and remove it (filling and patching screw holes and the like). Talk about dead-weight loss. Bastiat's "Broken Window Theory" put into practice (http://www.econlib.org/library/Bastiat/basEss1.html). Those poor contractors wouldn't have any work if it weren't for the diligence and effort of the Phoenix city council. I don't see anything offensive about that mural. Why ban it? Bob--the city considers it a "billboard," which is either illegal or just hadn't been applied for. As I recall they were fining the store every day it was visible. Re: pool codes. My parents used to have a pool that they had never had inspected, which I always thought was really weird because my father was always very upstanding. Of course, when I began to learn how onerous the codes were I could understand. And frankly, I always thought it was obscene that you could be liable if someone else's child trespassed on your property and drowned himself. Sigh. But I never even heard of rules that applied to the inside of the home, that is just wild! Note that the 54" high lock violates ADA requirements! So d'd if you do and d'd if you don't. While I'm generally sympathetic to anybody that promotes freedom, these guys haven't a leg to stand on there. The court case refers to CONTENT of expression - and assuming the town would be just as eager to remove the banner if it said was a swell guy the mayor was, the CONTENT is not at issue here. Note that the 54â€³ high lock violates ADA requirements! Does ADA apply to private residences? I thought Coyote was talking about his personal residence? Does a Home Ownership Asscociation not engage in the same behaviour as local government? Can the restrictions of a H.O.A. be really be defended by the standard retort "well it's a private entity anyway"? As far as HOA are concerned, that is a private contract between you and the rest of the community, also in the same contract. I dislike them too, but if you don't like them, don't live there. As for the pool thing, around here it was always explained to me that the laws were written that if someone else's kid wandered onto my property and drowned in the pool, I would be liable, so to protect me from those laws they wrote more laws to save me from that. OK, I get it. Swimming pools and dogs are, in effect, governed by the similar sets of rules and both sets of rules are promulgated and enforced by the same sets of morons. Dangerous dog laws all too often place egregious limits on *licensed* owners of selected breeds -- even when such breeds are not responsible for a larger percentage of bites. Regardless of breed, most bites are committed by *unlicensed* dogs roaming at large or interacting with strangers (usually children) without supervision. And of course, instead of punishing the irresponsible owners of these dogs (or in some cases the clueless dolts that invite attack) - we kill a dog who is, in reality, a victim as well. Come Bobby L! I asked if there is another explanation other than the private version "love it or leave it". I can't see why people would complain about government regulations then ho humedly abide by private regulations. Aren't regulations just, well, regulations? The difference is that private regulations are that you usually have to assent to the private regulations - if you purchase a property with a restrictive covenant, you agree to the regulations when you purchase. Not so much when you buy a condo, since the condo association can come up with new ones that are quite disagreeable - I doubt I would ever buy a condo. Government regulations can be imposed on you without your consent, and usually are. There is sometimes an awareness of the irritations this can cause, hence the concept of "grandfathering". The [URL=http://en.boabc.com/8005.html]China wood report[/URL] herd is estimated to contribute 1% of the UKâ€™s total greenhouse gas emissions.China wood report director general Jim Begg said: 'Everyone knows that cows produce methane and the presumption is that nature must take its course.The Ethiopian Meat and China wood report Technology Institute (EMDTI) said it is providing technical support to various organizations.Supermarkets and processors will be acting to ensure supplies are available and so there is little risk of milk shortages.In October and November, when milk yields are lowest, the report warned there will be a 'theoretical shortage' of 0.5 million litres a day.If we do not get our act together and start being treated with proper business principles we will disappear altogether.Straying away from fry grease and diesel shuttles, the [url=http://www.streetsupplier.com/]www.streetsupplier.com[/url] Trapp Family Lodge offers fine Vermont maple syrup the old-fashioned way.Hurricane Ike and its projected path into the Gulf of Mexico provided some support for [URL=http://en.boabc.com/8004.html]China cotton market[/URL].About 1 million barrels of China cotton market and 4.7 billion cubic feet of gas remain shut in.China cotton market for October delivery fell as much as $1.57, or 1.5 percent, to $104.77 a barrel and traded at $105.51 at 9:01 a.m.'Offshore oil and gas operators in the Gulf of Mexico who are working to restore production following Hurricane Gustav have begun preparations for Hurricane Ike,' MMS said.Europe and Asia and supported strength in the U.S. dollar, luring investors away from the oil market.Members of the Organization of the Petroleum Exporting Countries are expected to make an announcement on production quotas Tuesday in Vienna.India has the potential [url=http://www.china-embassy.org/]www.china-embassy.org[/url] to become a major manufacturing power with its stable democracy, skilled manpower and inexpensive labour.Innovative way to deal with [URL=http://www.confuciusprograms.com]study in china[/URL] safety issues that knew no borders and could appear anywhere in the food chain.Growing health consciousness among consumers is also a major factor contributing to the rising demand for healthy and organic study in china in restaurants.Given that our annual study in china is a $100-billion enterprise.But not everyone is happy with the conclusions of the report.Conservation and water use efficiency are critical to addressing our water challenges and agriculture is doing its part.While some farmers have been moving in the right direction, growing more food with less water under difficult conditions.They landed in New York at 2:30 p.m. At 4:30 p.m., Johnson [url=http://www.daff.gov.au/]www.daff.gov.au[/url] was yukking it up with Letterman through her jet-lagged haze.